Transitional cell carcinoma (TCC) of the bladder is the fourth and ninth most common cancer in men and women, respectively (Jemal et al. 2005). Gross or microscopic hematuria is the typical manner of presentation (>80%). Seventy-five percent of patients are found to have superficial TCC while the remaining 25 % are diagnosed with muscle-invasive disease. Treatment is primarily surgical with transurethral resection and radical cystectomy representing the standard options for superficial and invasive TCC, respectively. Since hematuria arises from the tumor itself, isolated or recurrent episodes of bleeding can be expected to resolve upon resection of the primary tumor. Exceptions do exist, however. These include: (1) large or locally advanced tumors deemed unresectable by cystectomy and (2) invasive tumors diagnosed in patients whose health status precludes cystectomy. 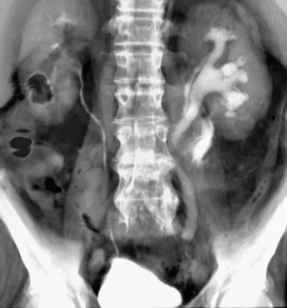 Transurethral resection alone is inadequate in these cases and patients often develop troublesome hematuria as a consequence of inevitable tumor progression. Patients with advanced bladder cancer who fail conservative measures, as outlined below, may receive benefit from the addition of external beam radiotherapy. Radiotherapy for this purpose is generally well tolerated and may lead to resolution of hematuria in up to 59% of patients (Srinivasan et al. 1994).